After Midnight, Night Owls Pack On The Calories : Shots - Health News People who were forced to stay up until the wee hours in a sleep lab ate food packing more than 500 extra calories. 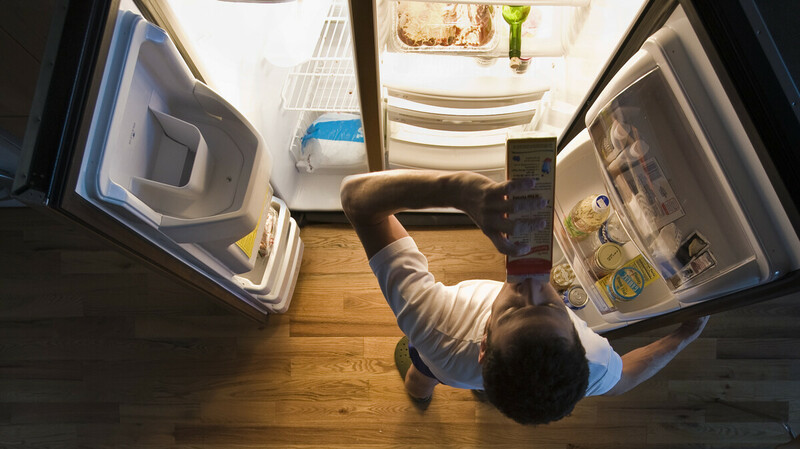 For people who regularly miss out on sleep, these late-night calories can really add up. Late nights lead people to eat more. Now we know what you're doing when you're staying up late. You're eating 553 calories. That's the equivalent of a Big Mac, and also about one-quarter of the recommended daily caloric intake for an adult. Our guess is that the people eating that big chunk of chow in the wee hours didn't fast during the day. So it's not surprising to hear that people who slept as little as four hours a night in a sleep laboratory gained weight, about two pounds over nine days, while people getting a good night's sleep didn't. This findings come from what appears to be the largest, carefully controlled study so far on the relationship between sleep deprivation, eating and weight gain. Earlier studies also have found people who slept less gained weight, but they included fewer subjects. This study took advantage of the University of Pennsylvania's busy sleep and chronobiology laboratory to track the sleeping and eating behavior of 225 people. The results was reported in the journal Sleep. Men gained more weight than women, overall, and African-American participants gained more weight than Caucasians. On the nights when the researchers made people stay up late, they ate more. The researchers measured the calorie count in a smaller group of 37 people to come up with that 553 calorie number, eaten between 10 pm and 4 am. The participants also chose foods that were higher in fat. "It was all during the late-night period," Andrea Spaeth, a graduate student in psychology who led the study, tells Shots. "That's a ton of calories." The study didn't measure hormone levels or metabolic changes. But other studies have found that people gain more weight when they eat the same amount of food in the evening rather than in the morning. It's good to be aware of the lure of late-night food, Spaeth says. Picking a reasonable bedtime and sticking to it consistently might be an effective way for people to keep their weight in check, she says. At the lab, they tuck the control subjects into bed at 10 p.m.